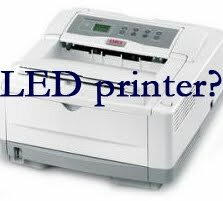 Ideas about LED Printers | TonerGreen - Eco-Friendly Toners from the U.S. LED printers are a little similar with laser printers in using toner with heat to create a printed work. The difference is that LED printers apply Light-Emitting Diode array (which is LED for short) to stick the toner to the imaging drum or belt. An LED printer is thought to be more efficient and reliable over laser printers because of its easy functions. It also has a less expensive price compared to its rivals which makes it economical for wise buyers. Most of the time, LED printers are compact in size for perfect spaces in homes or even in workplaces. The downside of an LED printer is that it has a relatively lower resolution compared to a laser printer that can reach up to 1200x1200 dpi. LED printers only have a resolution of 600x600 dpi or even uneven resolutions like 600x2400 dpi. However, when you are not too concerned on the resolution part, you can switch to an LED printer for greater savings. If you still want to stick to your laser printer but you need ways to save on your consumables, try using compatible cartridges that not only offer low prices but also produce high quality printouts.